Yo Vinnie... By your post about the gas situation, I would have thought that Gov. Christie would have made his executive order statewide. Aren't things that bad in the southern part of the state too? It seems that it only affects counties above the Raratin river and no counties south of it. If I remember my county locations correctly. out here in snowville, the larger filling stations have their big-axe generators out back fueled and ready to rumble all the time. every couple years it comes in handy. while I'm sure a few operators like Ashland/Superamerica and Holiday thought of it in the 30-inch Halloween blizzards, Y2K made it a point of advertising, thus, good stuff. doubt a 6-pumper in midtown would have space for one, but the block-long palaces would. but it will probably take two years to get each one permitted because of the tough fire regulations. meanwhile, this weekend, there are 5 points with a line of 5000 gallon military tankers in Noo Yawk City (git in line) where anybody can get 10 gallons of spill, no questions, no cash, keep it moving, thanks to Presidential orders to the Department of Defense. I'm 1400 miles away, and I approve cutting the red tape and getting something done. I am unaffected by rations or storm. If you divide up the state into 4 quadrants, we are in the lower left. That part sustained little of no damage, largely because the eye passed right over us. Good news today. My old hometown of Carteret is getting power today, and many friends have power today. Still quite a few out. The gas problems have improved 100% in 24 hours. ...then maybe it's OK if I mention I bought gas on my way home tonight. Regular unleaded, 100% gas (no 'ahol'), $3.079. 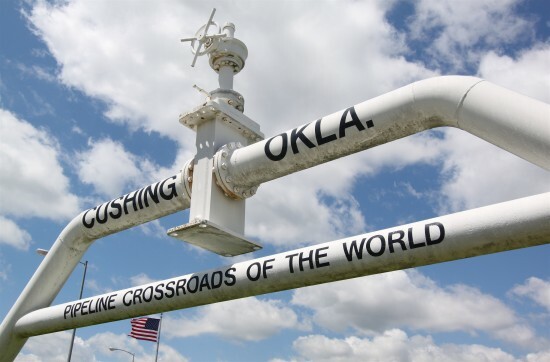 Cushing, OK near Tulsa is a major pipeline terminus that claims the largest tank farm / storage facility in the world. Visualize a railroad switch yard with pipe instead of track, and it's not unusual for gasoline to come in faster than the market wants it. Last week it was $2.989 all over town. Diesel is still $3.799 a gallon which seems high by comparison, but Oklahoma has traditionally been a favorite state for long-haul truckers to top off their tanks. Probably costs a little more in surrounding states. There's a pantload of truck traffic on I-35 and I-40 with no shortage of buyers, so the next time you hear the song "Convoy" by CW McCall pay attention to the lyrics.... It's essentially LA to Chicago by the modern equivalent of US 66. The mother road for your mother load. FYI. I It survived. My Imax survived, even though I left it up. For an el cheapo antenna, the Imax is pretty resilient. Not only will you find a vintage Yazoo, but some Heathshkit and CW items too. I think the plastic bottle with the orange label sitting in front of the radio is the original DX Wax Antenna Treatment. Not only can it renew and preserve copper and aluminum, but it's worth +2 dB in a pileup! You could record your own world series play-by-play! Except this time the Yankees win........ Three. You got a nice radio with what could be an easy fix at a fair price, but does this mean you won't be considering THIS or THIS or (OMG!) THIS?? Hate to mention it, as I know they're tempting... But... I'm like that. In any case, it's a done deal. The battery holder can be subbed even though it looks like someone gave up on that idea. Look at the thumbnail pics in the eBay advert and the one with the back open shows two blue electrolytics in the upper right and a black transformer in the lower right. I have a strong hunch someone added an AC power supply which will confuse you since it's not on the squidmatic. Remember that the diode(s) always point to + . Had one. Someone dropped it off at my QTH an gave it to me. However, this was way back in my ham infancy and several years before restorations. I had no use for it, nor did I know what I was going to do with it. Looking back, had I gotten it a little later, I would have given it to W8JI or someone on this board that does Homebrewing for contests on 160. I think I gave it to a antique collector for marine gear. BTW, I accepted an offer from a company on Friday. They are now doing my background check. Considering the situation in the area I'm surprised you were able to score an offer so quickly. Be on your best behavior for the first few months as they will be keeping an eye on you and do not fall into the groove of assuming you do things the way you always did at the old place. Because the new place isn't the old place. And for all you know you got the job someone else wanted. Give 'em some time to get used to you. BTW: Here's the job you really wanted...... OMG! It's perfect! pending congrats on the new pending job! Background check should come clean, but lead them to this board! I'm in trouble! .....what if you had used me as a reference? I can imagine it now................. " You want fries with that ?? "